A fresh light and summery zucchini ricotta gnocchi with fresh basil and a hint of lemon. Zucchini season is in full swing and it is both plentiful and cheap so I have been taking full advantage of it by using it in plenty of recipes both old and new! This zucchini ricotta gnocchi is one of the new recipes that I have tried this year and I could not wait to share it with you! Gnocchi are Italian soft dumplings that are typically made with either potato or ricotta along with flour, eggs and cheese and it is often served like pasta in a sauce. One of my favourite variations of gnocchi in the fall is a pumpkin gnocchi and I could not help but wonder about a summer zucchini version. I wanted the zucchini gnocchi to be nice and light so I decided to go with a ricotta base rather than a potato one and this had the added benefit of making things easier since you do not have to start by cooking the potatoes. The one problem that I foresaw was that zucchini contains a lot of water and that meant that you would need to use more flour and that meant the gnocchi would be heavier so I started things off by salting the shredded zucchini and squeezing out as much liquid as possible. To give the gnocchi even more summery flavour I added a fresh basil and a touch of lemon zest. Although it take a bit of work, gnocchi is actually pretty easy to make. Once the gnocchi dough is mixed all you need to do is roll it out, cut it into small pieces, roll the pieces over a fork or gnocchi board for texture and then boil it before tossing it in your favourite sauce. I cannot believe how wonderfully good this zucchini ricotta gnocchi is! It is so light and fluffy and full of summery flavours! In all honesty I could not stop eating it after it was cooked, before it even made it into the sauce! You could easily serve this gnocchi in a simple sauce like butter and parmesan but check back tomorrow to see what I served it in. Mix the zucchini and salt, let drain in a colander for 20 minutes, place in tea towel and squeeze out as much liquid as possible. Mix the zucchini, basil, lemon, ricotta, egg, cheese and pepper and then mix in enough flour to form a dough that is not too sticky to work with. 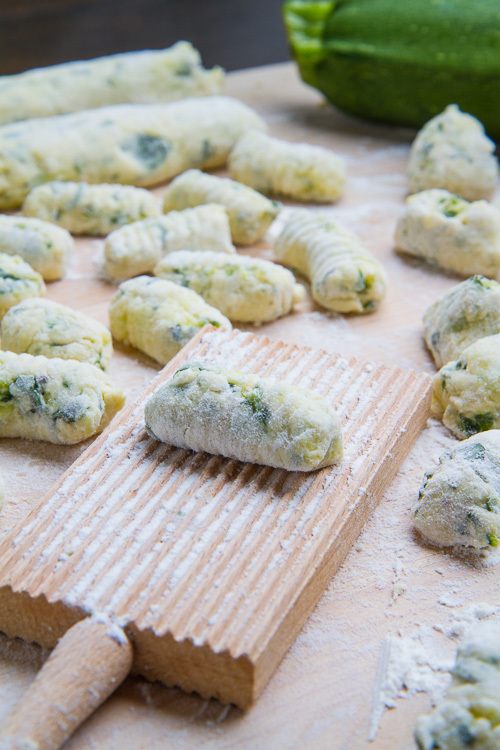 Divide the dough, roll into 1 inch thick strings, slice into 1 inch pieces and roll over gnocchi board or fork using enough flour that the dough does not stick to everything. Cook the gnocchi in boiling water until it floats, remove and enjoy in your favourite sauce. Note: The trick to a nice light a fluffy gnocchi is to use as little flour as you can but the less flour that you use the more sticky the dough is and the harder it is to work with. Another problem with adding too little flour is that the gnocchi may fall apart when cooked. It is a good idea to test the gnocchi by cooking a couple, pulling them out as soon as they float in the boiling water, to make sure that they are holding together. 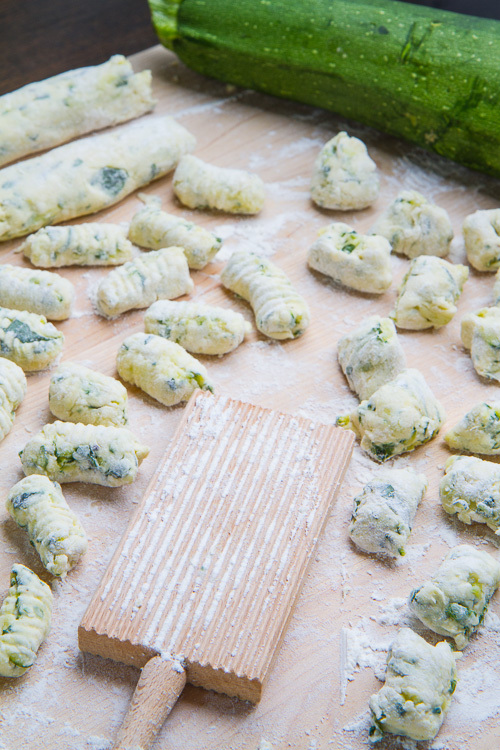 The amount of moisture left in your zucchini and the different amounts of moisture in different batches of ricotta makes it difficult to pinpoint the exact amount of flour required for each batch of gnocchi so it is best to start with a little and keep adding until the dough gets tot he right consistency. This is such a fun flavour for gnocchi! I can't wait to try it!! Beautiful and surely scrumptious! It is a great idea to use zucchini when making gnocchi. I have some ricotta needing to be used up right now, and this would be perfect! We love how light the ricotta base is and I love that I can finally use up more zucchini! I was just think it would be fun to put zucchini in gnocchi! These look awesome, Kevin! i made gnocchi once and really liked it. I will definitely be making these soon. I love gnocchi and I love zucchini! This is such a fun way to pair those two together. Can't wait to try this! Kevin- these are incredible! I am always intimidated, but these look doable and wonderful! I absolutely love that you added zucchini! I've been wanting to add avocado to gnocchi for awhile but haven't gotten around to it. Thank you, what can I use instead of flour being gluten-free? Anonymous: Rice flour will work for gluten free. damn kevin! that looks freakin good! I soooooo want this for dinner! It is not fair that my kitchen is still undergoing renovations – because I can't make these!! They look so delicious! I will DEFINITELY try these. Thanks Kevin for your inspiration ~ over & over. Love it all. Could you substitute 100% whole wheat flour for the white flour? These look amazing!! Definitely a recipe i need to make before summer is over! I can't wait to see what you served the gnocci in…I think you've just changed my whole menu for this weekend!! Anonymous: These should freeze well. I recommend freezing them individually spaced on a baking sheet before placing them in a container together so that they do not stick together. Wow these look so amazing 🙂 Really want to try! I've never made gnocchi but I do love them. How does it work with the board? I've seen them made with a fork. this is seriously awesome! love the ricotta in this! Mistress Snowbound: You just roll the balls of dough over the board and it gives them that nice ridged texture. Seriously amazing Kevin, they look perfect! This looks lovely, what a beautiful way to use up zucchini! After some difficulties, this actually worked out! And tasted pretty darn good. Even better as leftovers, that we pan fried the next day. Yum! Christina Bauer: Glad you enjoyed it! I also fried the leftovers up until crispy! I made this for dinner last night with the Creamy Gorgonzola sauce. It was fabulous. Must work on the presentation and practice my gnocchi making skills! Can you tell me what the consistency of the dough should be? Mine was a little wet. I did freeze them before I cooked them, but the managed to disintegrate somewhat! Sheryl Cox: I am glad you enjoyed it! The dough should be light and still sticky, you will need to flour it for rolling into strings and more for rolling it on the board or fork. It is kind of a balancing act of adding enough flour that you can work with the dough without adding too much where you end up with heavy gnocchi. Gnocchi will start to come apart if cooked too long, you want to pull each piece out of the boiling water soon after it floats to the top even if it does not all float at the same time. Thanks for giving me a new way to try mastering gnocchi! To cut down on the salt, I replaced the zucchini with half a pound of arugula. After cooking them, most of the arugula taste was gone, but the gnocchi worked out well! I served them with a tomato-Parmesan sauce. Gnocchi still scare me a little, so I added half a cup of extra flour. Next time, I will try to get by with only a mountain of extra flour for forming the gnocchi, no extra flour for the dough. Great recipe!! megarette: Yes the zucchini will reduce a lot after draining it of excess liquid but the ricotta will fill out the dough. Whole wheat flour would make the gnocchi a bit heavier but it would be a little healthier. When you say that it was gooey in the middle, was that after boiling until it floated to the top of the water? How big were your gnocchi pieces? When I first made gnocchi it took a bit longer as well but once you get the hang of it, it speeds up quite a bit. i cook every night from scratch and this just did not turn out. i love gnocchi and am so sad. i followed the recipe to the T and when i drained the gnocchi it all fell apart. turned into mush. so bad that i had to abort the mission and cook dried pasta i had in house. i don't know what could have gone wrong. yikes! help!! i wanted to love this! it looks so delish in the pic! any suggestions would be well received and appreciated! roonie27: I am sorry that it did not work out for you! It sounds like there might not have been enough flour in your gnocchi. 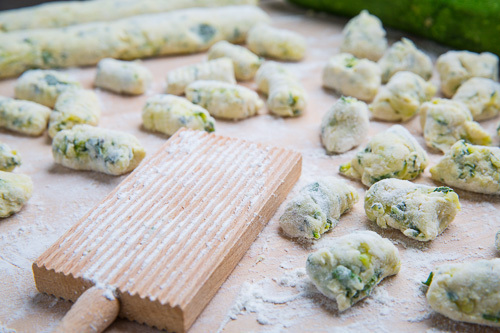 The amount of moisture left in your zucchini and the different amounts of moisture in different batches of ricotta makes it difficult to pinpoint the exact amount of flour required for each batch of gnocchi so it is best to start with a little and keep adding until the dough gets tot he right consistency. I recommend that you make and cook a few to make sure that they cook properly before continuing with the rest of the dough. That way you can make corrections and not loose an entire batch. I have updated the recipe with these tips! I love your blog thanks for responding to the comments. I think I am going to try out your Jerk Pineapple Grilled Shrimp this weekend— taking it easy. But someday I will conquer gnocchi!! Have a nice day! I love the flecks of green zucchini in these gnocchi. Beautiful! Made these last night with the gorgonzola corn cream sauce – added cherry tomatoes for some acid – yum yum! The gnocchi had a different looser texture but didn't quite fall apart when cooked. I used about 2/3 c flour + more for the board. Will make again! Thanks!! Bec: I'm glad you enjoyed it! The addition of the tomatoes would be amazing! I might even roast them a bit to bring out more flavour! Do you freeze them before or after cooking? Anonymous: You can freeze them before cooking. Place them on a baking sheet separated, let them freeze and then transfer them to a bag or other container to ensure that they do not stick together. Are the four cups of zucchini after it’s shredded and drained? How much zucchini to start with? That is 4 cups of shredded/grated zucchini, about 2-3 medium zucchini. Enjoy!